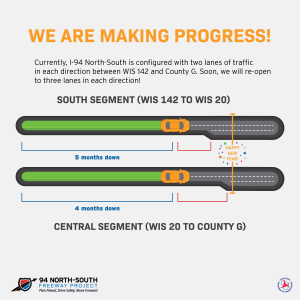 The Wisconsin Department of Transportation’s (WisDOT) I-94 North-South project team is announcing a traffic shift and reopening of a lane of traffic on northbound I-94 in part of Racine and Kenosha County. The completion of the new pavement and structures is allowing the northbound traffic to be shifted and a third lane reopened to traffic. 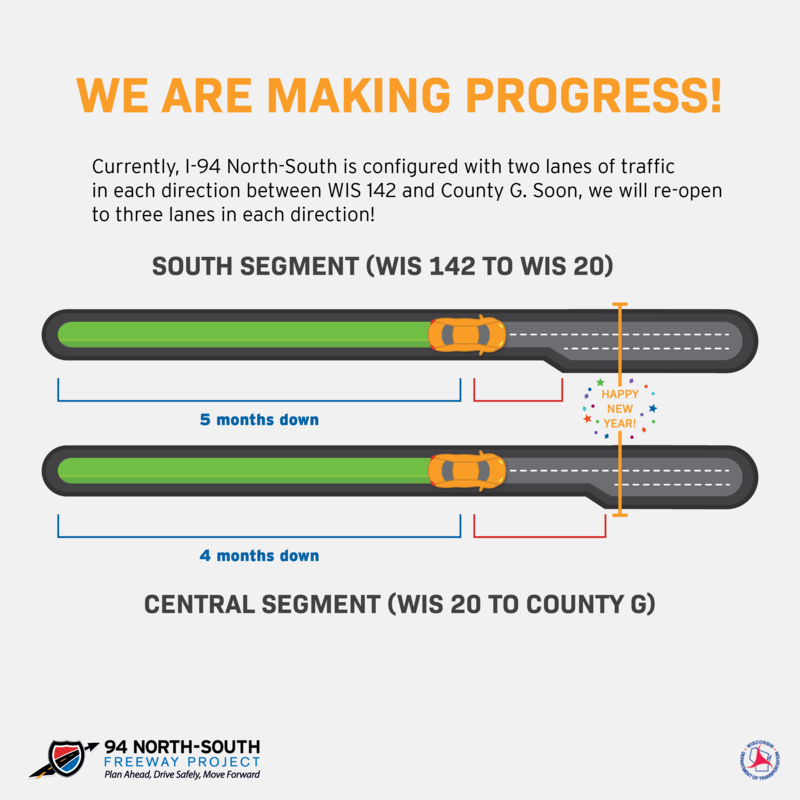 The area that will see the reopened lane is in the south segment of the overall project. The crews will use a full freeway shut down of the northbound lanes of traffic between WIS 142 and 7 Mile Road beginning at 10 p.m. on Wednesday and wrapping up by 5 a.m. Thursday morning. There will be a single lane closure beginning at 8 p.m. to prepare for the full closure going into place. Traffic will be moved onto the new northbound pavement. The ramps along this portion of the project will be opened at a later date. The third lane between WIS 20 and County G is expected to be reopened a week later, weather dependent. Watch this Facebook video to see our plan for the month of December.